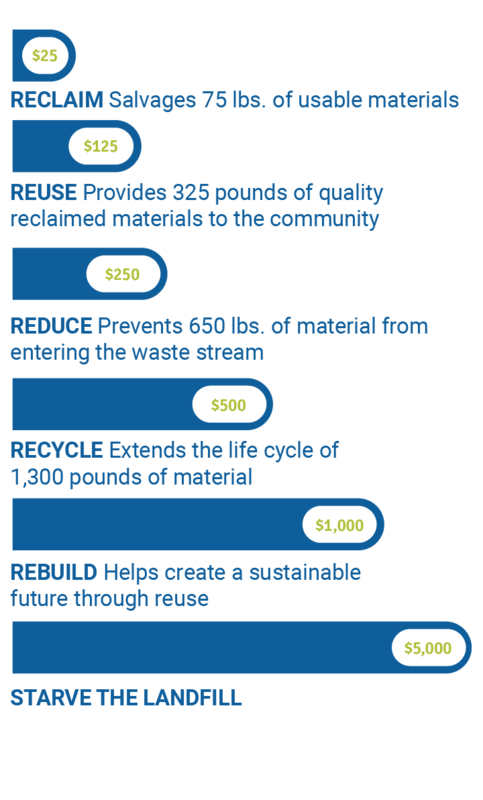 A monetary donation helps support our mission to provide quality reclaimed materials for reuse, including our donation pick-up and deconstruction services which divert more than four million pounds of reusable building materials from local landfills each year. Your funding also supports the growth of our Gifts In Kind program. For every $1 raised, $55 worth of essential items are distributed to non-profit agencies to help those in need within our community. You can make a tax-deductible gift to Stardust via the PayPal link below. Your monetary donation to Stardust has a measurable impact on your community, through the promotion of reuse and the prevention of perfectly good materials overflowing in landfills. Your funding supports our mission and day-to-day work, including staffing, truck maintenance, and deconstruction service. No matter how big or small the donation, your support makes a world of difference.